Scroll Down for 2018/2019 Season Information! 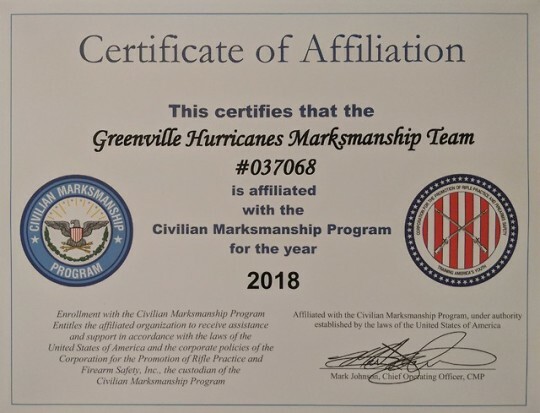 The UHC Hurricanes Marksmanship Program uses individual and team shooting sports to help develop the skills of commitment, discipline, focus, respect, responsibility, safety, sportsmanship, teamwork, and a strong work ethic from a Christ-centered worldview in the lives of our youth members. The Marksmanship Team will practice with .22 rimfire rifles, .177 air rifles, 9mm GLOCK pistols and 12 gauge shotguns. Each student must successfully complete the NRA Basic Rifle Shooting Course administered by our NRA Certified Firearm Instructor. This course teaches basic knowledge, skills, and attitude necessary for the safe use of a rifle in target shooting. 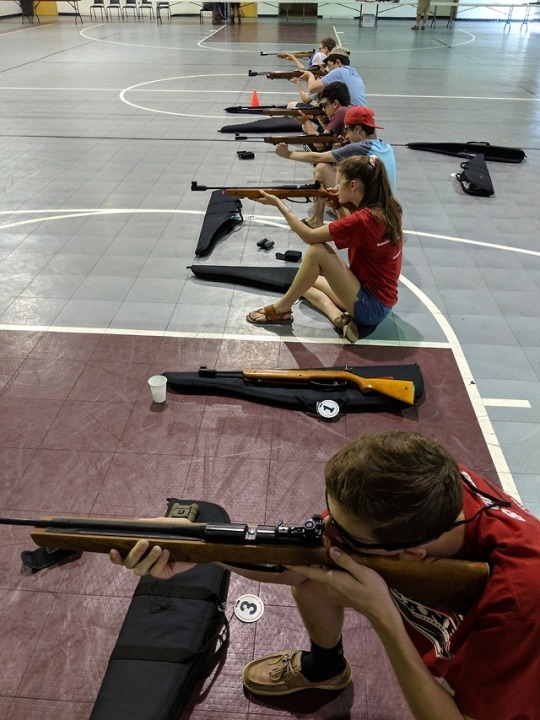 After classroom instruction, students receive practical shooting experience on the range in the following shooting positions: Bench Rest, Prone, Sitting, Standing, and Kneeling. Upon completion, the student earns a certificate in Basic Practical Rifle and becomes qualified to pursue further Individual Achievement Levels. Course completion also qualifies the student to join the Hurricanes Marksmanship Team. Bio for Program Manager Vic Seiter - Vic Seiter is a former police officer and an NRA Certified Rifle Instructor and Glock Sport Shooting Foundation Range Officer. He has served his community widely as a Boy Scout den leader, ESL literacy instructor, soccer coach, Bible Study Fellowship group leader and local businessman. He is a lifelong shooting enthusiast having been extensively trained by his father, an award-winning shooter and captain of the Citadel Rifle team. He and his wife Maylin are active in their church. His son, Jacob, has been one of our Hurricane Archers for the past 3 years. Season Dates: Runs from September 2018 through May 2019 with optional National Matches in June and July of 2019. PARENTS ARE STRONGLY ENCOURAGED TO ATTEND THE COURSE WITH THEIR CHILD. Course Registration- See Vic Seiter on Friday evenings at Sharpshooters Indoor Range, drop in 6-8PM. Email vicseiter@gmail.com with intent to attend. Sports Physical on file with Hurricane Athletics, renewed annually. Waivers for each parent and each minor filled out at Sharpshooters and kept on file with Vic Seiter. August 31 or September 7, both on Fridays, 7:00PM at Sharpshooters. Supervision from NRA certified Instructors, NRA Range Safety Officers, and Certified Coaches. DATED for October 15, December 1, and January 15. Please take advantage of Fundraisers that pay each family directly when gift cards and “Attractions” Dining Books are sold. Books handed out on Fridays at Sharpshooters for $10 each. Sell them for $20 each, you keep $10 for all your Marksmanship expenses. Apparel and logo gear sales. Additional opportunities to raise funds TBA at practices. WE STRONGLY RECOMMEND TEAM MEMBER FAMILIES USE THEIR OWN GUNS. Gun ownership is regulated by local, state and federal laws. Age for ownership is 18 yrs-long guns, 21 yrs-pistol. Safe and proper use of guns by minors is accepted with authorized adult supervision. Air Rifle with competition sights $125 through CMP (limited inventory on hand). Rimfire .22 Rifle with competition sights $277 through CMP (limited inventory on hand). Eye protection, Ear protection, closed toe shoes, Ammo, targets, Notebook, Prone mat, kneeling roll. If you bring your own firearms, they must be CASED AND UNLOADED until checked in by the RSO. BRING THE PROPER RESPECT AND ATTITUDE NECESSARY TO PARTICIPATE IN ACTIVITIES INVOLVING FIREARMS. ALWAYS FOLLOW ALL LOCAL GUN LAWS WHEN TRANSPORTING, CARRYING AND HANDLING FIREARMS. ALWAYS FOLLOW ALL NRA SAFE GUN USE, STORAGE AND HANDLING RULES. Hurricane Athletics offer fantastic opportunities to Upstate students interested in sports. Whether scoring a touchdown or a goal, shooting a basket or a bow, hitting a ball or a mark, running a race or a routine, there are many advantages to participating in team and individual sports. The Marksmanship team is no exception when considering the benefits of sports. Not all sports use a ball, but they can have a goal to reach, a point to score, a target to aim at, or a time to beat. A Hurricane Marksmanship team member practices to develop skills and character, exercise control, and learn the safe use of our rifles. Shooting Sports help develop certain qualities that can carry over into other settings and relationships throughout the athlete's life. We work together as a team, compiling individual scores to reach a team score at matches. We encourage each other to do well and improve as a team. Individual target scores are recorded at every practice to reach various levels of skill qualification set by the NRA to earn multiple awards ranging from Pro Marksman to Distinguished Expert. Concentration is required and self control is essential. The bullseye on a paper target is the same size as the air rifle pellet ( .177 inches or 4.5 mm ). An individual practices to hit the bullseye, 10 meters down range. With the small bore Rimfire rifle, a bullet ( .22 inches or 5.5 mm ) is shot from a distance of 50 ft and also has a bullseye the size of the bullet. The shooters must focus on several things all at once, disciplining themselves to do well. Body movement must be minimized, creating a stationary rest for the rifle. Breathing must be controlled. A disciplined touch of the finger on the trigger, slowly squeezed is important. Using your dominant eye to take aim at the bullseye and using both front and rear sights all perfectly aligned throughout the entire shooting process makes this sport challenging and fun. 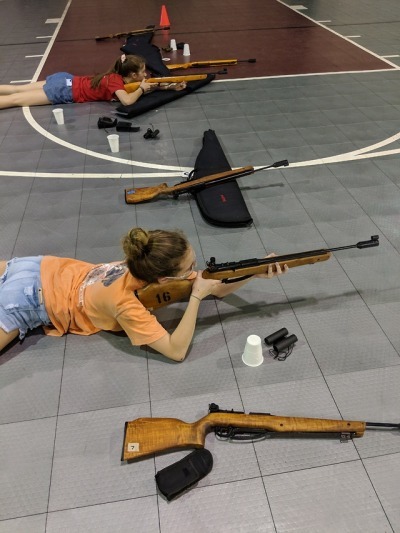 Students go through days of training and testing to pass the NRA Basic Rifle Shooting Safety Course that teaches the athlete to never be around a gun unless a responsible adult is present. When responsible, trained adults are supervising shooting activities, the marksmanship team upholds mandatory rules. * Always keep your gun pointed in a safe direction. * Always keep your gun unloaded until instructed to fire in a safe direction. * Always treat every gun as if it were loaded. * Always keep your finger off the trigger until instructed to shoot at the target. We are a "Cold Range" meaning we keep all firearms cased and unloaded with safetys on and actions open until instructed to uncase, load and make ready only at the firing line. Handling of any gun is prohibited until Range Safety Officers verify targets, what is beyond the target, confirm empty gun chambers and make sure eye/ear protection is on everyone. Safe handling areas are designated for cased, empty guns to enter. As guns are uncased in these designated areas, an RSO will verify empty as the handler also confirms empty. Ammunition is prohibited in these areas. Function tests, cleaning, and take-down/reassemble activities may be performed only in a designated Safe Handling Area supervised by an RSO. Multiple parents have become trained and certified NRA Range Safety Officers to oversee the Marksmanship team during practices. Team members help each other follow the safe use and handling guidelines they've agreed to keep by demonstration and verbal reminders. Why not consider the Marksmanship Team and take advantage of an opportunity to learn more about safe Shooting Sports to develop individual skills and qualities that will last a lifetime.